A while back Telis asked me if I would design something for the Samsung Gear 360 – Samsung was a client of the agency he works at. I designed something to go on top of a Full Tilt Boogie, a simple Zoompod-style TPU mount that sat on standoffs. Samsung is also a sponsor of the NYCDFF, so festival founder Randy Slavin built one up as well. I never got to see Telis fly his in person, but I did see Randy fly his . He only flew it in horizon mode, and never at speed. Being completely inexperienced at 360 video, I couldn't understand the point of not ripping a perfectly fine quad. This is how little I knew about 360 video, I put the seam front and center in the first version. Turns out that 360 video is nauseating if the horizon shifts around too much, hence Randy's slow and steady flying. We started talking about a better solution, one that would stabilize the camera, as well as put it far away from the frame in order to minimize it in the video. We decided to suspend the camera below the frame using its telescoping monopod, which would extend and contract on takeoff and landing. The battery would be held at the opposite end to counterbalance the camera, with a universal joint in between. I wanted it to be just bottom heavy enough to stay vertical, but with its CG close enough to the pivot so that it wouldn't sway too much with accelerations. The Samsung is relatively light, so I hoped that a passive gimbal system would work. In reality, I knew that 'passive gimbal' isn't really a thing, but maybe it could work well enough in a slow flying frame. There's an early bicycle suspension fork that uses a simple friction piston for damping. I hoped that a friction interface on a ball joint would dampen the swaying motion enough to be acceptable. I printed up a ball sliding atop a cup, but it was too unpredictable and un-tuneable. Now I was even more sure that a passive gimbal wouldn't work, but it deserved a more serious attempt. I thought I needed to de-couple the damping mechanism from the joint, so I drew up a true universal joint. I still wasn't sure about the damping mechanism, but I could try foam, springs, 3d printed dampers, or friction pistons. I whipped up a frame around the universal joint, with super long legs to accommodate the monopod below. Here's the universal joint. The axle in the middle is carbon sandwiched with PLA pieces to round it off in the bearings. TPU holders for the bearings worked great, the whole thing was smooth as silk. The monopod screws into a 1/4-20 inside the white plug down below. Randy building it up with 2216's and Kiss 30's. The battery goes in the blue holder above. The white H shaped piece on the vertical stanchion is an attempt at a damping mechanism. The system could theoretically be tuned by varying the shape of that spring, monopod extension can be tweaked to vary how bottom heavy the swing arm is. I'm not sure why we thought it was a good idea to maiden a 10" quad with a crazy swinging arm indoors (with my daughter present too), but we did. It did not go well, though, all things consider, it didn't go nearly as badly as it could have either. So, it turns out the spring I had wasn't nearly stiff enough, and the arm needed more clearance so it can tilt more without hitting the frame. I'm just glad Randy kept his cool and brought it back down without incident. I do like this screen grab, though. Right after this Randy got real busy with the LA Drone Film Fest, and since the build was paired to his radio, I didn't spend much time trying to refine it. I was pretty sure that the thing would work 'ok' at best, and could only be perfect with a true brushless gimbal stabilizing the arm. Meanwhile GoPro introduced the Fusion, their version of a 360 cam. It has a more quad-friendly form factor, is higher res, and, most importantly, has digital stabilization. What this means is that your horizon is locked, even if you give the camera a toss! This is an especially important feature, since it eliminates the need for that wonky pivoting boom. All I needed to do now is get the camera far away from the frame. Now, just imagine all that, but with no drone in view except when looking straight up. All I'd need to make that happen is a boom mount for the Fusion which will slide down on takeoff. And now that I'm not using a monopod, the landing gear can be much shorter as well. I'm pretty sure that the Fusion's stabilization is good enough that I could just suspend the camera from a rope, but that would mean setting a lens down on the ground (and maybe dragging it too) on landing, so that's out of the question. I wanted to use a carbon fiber tube as the boom, but it was hard to find one long enough. I found a 3/4" wooden dowel at my hardware store for $5, which is super ghetto but way cheaper. I wanted to be sure it didn't bind when sliding, so I drew up a box with pulleys inside, using 5mm bearings riding on 30mm standoffs. It took a couple of tweaks to get the pulley size and shape just right so that the boom slid freely. Then I drew up new main plates with cutouts to hold the slider box, as well as shorter landing gear. I added a tab to the slider box so that the top plate would hold it down. Finally I extended the box so it could double as the battery mount. I wanted to get the battery higher to counterbalance the camera down low. Arknabbit had some fun with photoshop on this. So there's nothing left but to fly it, which frankly scared the crap out of me. I put horizon mode on a switch, and gave the throttle curve some expo – I'm so used to flying at 45 degrees + that I can't hold altitude on a level flying quad well any more. First I flew it without the boom LOS. I haven't used horizon mode since the Jerkybot, and I don't know how to tune it well. It seemed a bit aggressive, but I figured it would be good once the boom is added. FPV in horizon mode was really hard for me, impossible to be smooth, so I went to rate mode and the quad flew quite well, at least 'til the vtx started to crap out, so the rest of the testing was LOS. Next I added the boom without the Fusion and tried takeoffs and landings. I quickly learned that contact with the ground made the quad uncontrollable. Once the quad leans a bit there's no way to lift the low side – it just drives the boom into the ground. Any attempt to level the quad just results in scooting it sideways and crashing. I soon learned that takeoffs are doable if I took off quickly, just get the boom off the ground as soon as possible. Every landing, however, resulted in a tip-over. There was no point in trying to finesse it, just disarm once the boom touches and hope it sticks the landing, which it never did. Here's one attempt with the boom extended only halfway, still no luck. You can click and drag the video to pan, or use a phone and just move the phone around. As you can see, the Fusion's stitching is just amazing, only apparent when the sun flares one of the lenses – the sun only hits one lens, so the two halves are mismatched and the stitch becomes slightly noticeable. I suspect this was exacerbated by the fact that I'd had a few toppled landings already and the lenses were a little dirty, and the smears make flare worse. Here's the same flight reframed with GoPro's reframe plugin in Adobe Premiere. I love the delay between the takeoff of the quad and the camera, that's the boom extending. I cycled through a few views to give you a sense of what's possible, the camera is invisibly suspended in most of the views (which is the whole point of this exercise). 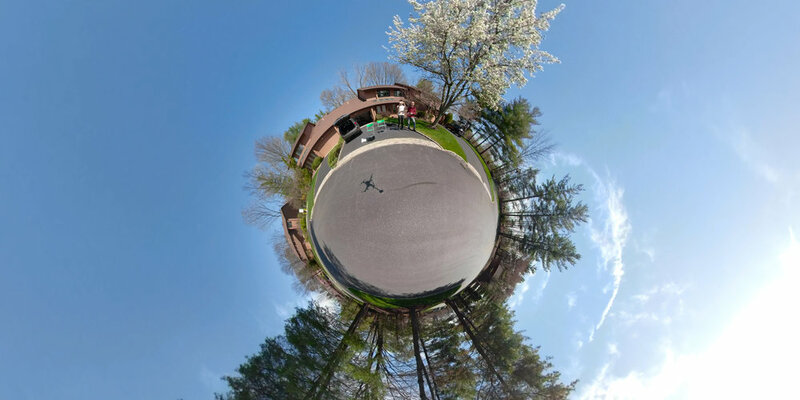 360 is pretty niche but you can see how this could be used to make conventional videos. For example, I could get the crash landing in frame even though I had no idea which direction the frame was going to topple. Time to install a winch. I wanted to just buy a sailboat winch servo, but this guy was out of stock, so instead I ripped out the continuous rotation servo that was sitting in the original Blast. My first thought was to use it to drive one of the pulleys in the boom holder – this would be simple and clean, no wire on a spool to manage. I drew up a pulley that meshed with the servo horn and enclosed the servo in one of the halves of the boom holder. It kinda worked, though the friction interface between the pulley and the boom was problematic. It needed more pressure between the pulley and the boom, or the boom needed to be painted with something to make it less slippery, or both. Also, it seems my pulley wasn't perfectly round, so that the pressure varied as it spun. Suddenly the 'wire on a spool' version started sounding better and better. I'm sure I could've gotten the friction drive system to work, but it'd be finicky and require pretty tight tolerances, and painting the boom would add weight as well. On to Plan B. I drew up a spool that would print around the servo horn, and then a housing for the servo that would support the other end of the spool with a standoff inside a bearing. The housing has a couple of holes that'll slip over standoffs in the frame. Now I just need new plates for the winch mechanism, and figure out how to run a servo off the Motolabs Tempest. Thankfully I had JFK to talk me through it, it sure was exciting when the servo finally came to life. I practiced on the Fusion and Premiere while I waited for new parts. The Fusion has a bad rap due to its rushed release, but it's really an amazing camera once you update its firmware and app. It was a pain to learn Premiere to get the most out of it, but it's nice to acquire another skill. The Fusion's a great dog cam – put it on a stick to get it down to dog level, and just point it in the general direction to avoid seam lines on your subject. There's no need to worry about leveling the camera, the Fusion's stabilization takes care of that. Once you shoot it you can apply camera pans and zooms in Premiere later. Enjoy some Corgi content while we wait for those new carbon plates. I swear I didn't pick the thumbnail for that second video. New body plates came in a couple weeks later, and I built it up only to find that the monofilament was too stiff and jammed the spool. Joshd and some others suggested kevlar string, which turned out to be the perfect material. Incredibly strong yet totally floppy. So now it's finally done! Time to actually go fly it somewhere (gulp)! I bike to fly most of the time, so it was hard to find the opportunity to test this. When I finally got it out to Randy's I found that the recycled vtx I put in there had its connector smushed off, so the first test was LOS only. For some reason it had a far worse oscillation this time. It was all I could do to operate the winch and keep it from crashing. The video looked really nice, however, that is if you disregard the excess string dangling in front of the camera. Oy. Yes you can find the seam, but it's really not that obvious. So I ordered some thicker Kevlar string, and made a rounded tpu cover for the bottom plate hole. 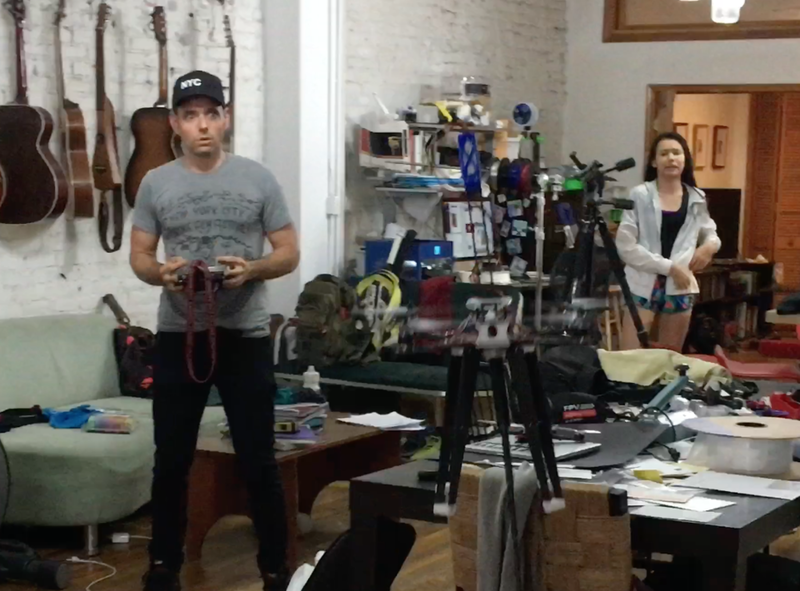 I fought the drone 'til Randy retracted the boom enough so that I could control it (about 3/4 extension), and did a few slow laps and landed it, only to discover that I never started the camera. Oy.